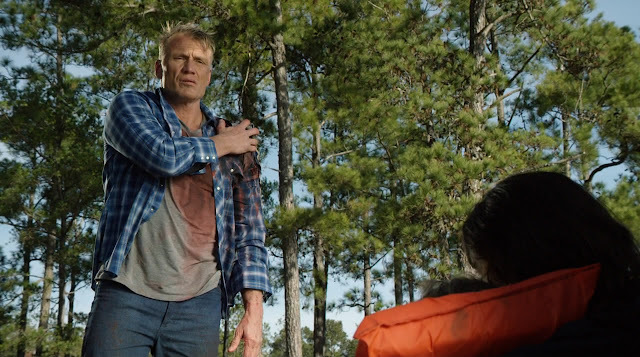 Dolph Lundgren stars in Shark Lake which has been dubbed by one fellow critic as "ridiculous fun," but sadly never achieves either of these. The current trend in genre cinema is to have a fun and highly-marketable concept for audiences like Battle of the Damned's Dolph vs. Robots angle or Against the Dark's Steven Seagal vs. Vampires concept - but something usually gets lost in translation between the filmmaking and marketing departments meaning that these potential B-Movie throwbacks never quite click. In the case of these previous examples and Shark Lake, it's that the marketing is more willing to embrace the B-movie qualities we hope for, whilst the filmmaking team have a habit of taking things too seriously. Instead of giving us a high-octane, creature feature throwback with Shark Lake, director Jerry Dugan gives us a pensive and unintentionally shoddily constructed piece which only disappoints. Lundgren stars as Clint Gray, a man who has just served a prison sentence for black-market animal trafficking - resulting in a deadly shark being released into Lake Tahoe. Upon his return from prison, vicious attacks start happening in the lake, meaning that it is up to the town's police department (headed by Sara Lane's police detective) to get the situation under control. Whilst Shark Lake obviously has a budget a smidgen the size of Jaws, The Shallows or other shark films like Open Water or Adrift, there are plenty of little tricks available to hide that. Think of how little we actually see of the shark initially in Jaws. However, Dugan's film instead of attempting to scare us with the unseen, opts for shoddy computer-generated effects that do nothing but cheapen the occasionally sinister atmosphere that is crafted in Shark Lake. It's not just the shark effects that feel cheap, an initial car chase in the opening scene actually shows no impact or collision - even as the van containing the shark enters the lake, we see nothing. It's hard to invest in any of the action when it all feels so cheap, inauthentic and often, invisible. As is customary with the latest Lundgren, Seagal or Bruce Willis direct-to-video flick, the lead star takes a backseat role and whilst Lundgren's screen time is still a solid amount, most of the investigating and shark-hunting is done by actress Sara Lane. Lane makes a solid lead as the gutsy Sheriff, but is not as an engaging presence as the much-loved Swede. Lundgren gets a few moments of cool that will appeal to his fans - including a couple of fist-fights and a major part in the film's final battle. Even at ninety minutes David Anderson and Gabe Burnstein's narrative really fails to engage, and this paired with Dugan's cheap and unconvincing direction, it means that Shark Lake is a bit of a slog. Anderson and Burnstein attempt to engage with a subplot involving Clint's daughter, whilst there are some patchy attempts at humour through the addition of a smarmy BBC reporter Gareth Ross (Miles Doleac). Shark Lake isn't the Dolph vs. Shark film that you want, it's an over-serious and tiring piece that fails to deliver on the B-Movie potential of its premise. Cheap production values and choppy direction ensure that this is certainly not Jaws, hell, it's not even Jaws: The Revenge. Stars: Dolph Lundgren, Sara Lane, James Chalke.